I am the very proud co-owner of Lemongrass House Canada here on Abbott Street. We opened a year ago this Friday on April 5th, and we will be celebrating our anniversary this Friday April 5th! All of our products are handmade, ethically sourced, and produced in Thailand. A lot of the spa culture we experience in North America comes from Thailand. I was on a trip there a few years ago, and I fell in love with Lemongrass House brand products and the people who made them. 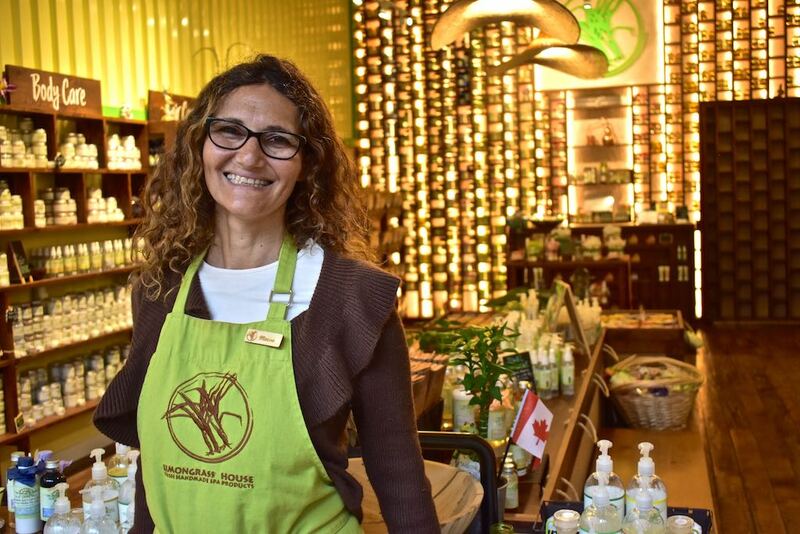 From a young age, I have been passionate about essential oils and natural skin care, and I characteristically felt very inspired to bring Lemongrass House to Canada. Today, we are the only retail location in North America. What led you to setup shop here in Gastown? Lemongrass House is unique. Everything is made in recycled shipping containers and you won’t find our products sold mainstream within malls or chain stores. We really wanted to be located on street level in a place that was authentic. We spent a lot of time looking for the right area and as soon as we came to Gastown we knew it had to be here. The sense of belonging was immediate. What really stood out was the age of the neighbourhood, the amount of handmade and quality made items available, and the independent spirit that fuels the life of Gastown – all of this strongly resonated with our brand. I feel like I’m in a real community. I have amazing neighbours, and we support each other every day. This is what we were looking for a year ago and I am so grateful to have found it here in Gastown. If you had 15 minutes only in Gastown – how would you spend the time? In my store! I do have a secret spot though that I love, and if I tell everyone exactly where it is then it won’t be a secret. I will say that it’s this charming little bistro on Water Street owned by a man that I love who makes delicious homemade food and the bistro has the best views in Gastown of the North Shore. Can you recall a particularly happy moment here in Gastown? Everything and everyday is a moment here. Watching people come into the shop, discovering our products, and falling in love with Lemongrass House – this is what brings me joy and makes me proud to represent such a worthwhile brand while having the opportunity to meet fantastic people from around the world. What’s your philosophy for living a good life? Find the opportunity and the obstacles. They are always there and it depends on how we react to the challenges of life – we can fall into the abyss or we can see what lessons are there to help us grow on the rocky road of life’s wild and wonderful journey.